G-BIACK Food Security Programme focuses on improving food security and on farm income through the application of the GROW BIOINTENSIVE AGRICULTURE organic, ecological technology options. GROW BIOINTENSIVE AGRICULTURE is a sustainable form of agriculture that emphasizes biodiversity and promotes biological cycles. 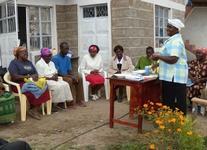 Farmers are trained on the use of locally available bio-resources with minimum use of external inputs. The technologies used are economically viable, environmentally friendly, culturally acceptable, and enhance social equity for a more sustainable development process. The G-BIACK Environmental Programme focuses on improving the environment through tree nursery establishment and tree planting; promoting the use of energy conserving and improved cook stoves that use minimum charcoal, firewood, and saw dust as fuel; promoting solar energy systems and biogas systems and providing a safe and environmentally friendly means of waste disposal and converting waste into high quality fertilizer for agricultural use. The G-BIACK center has a community resource library that is open to the public where the community members can come to source for information. (Information is power.) The Library which is continuously expanding has more than 2000 different books.